Help families plant a garden with PlantHOPE Kits. 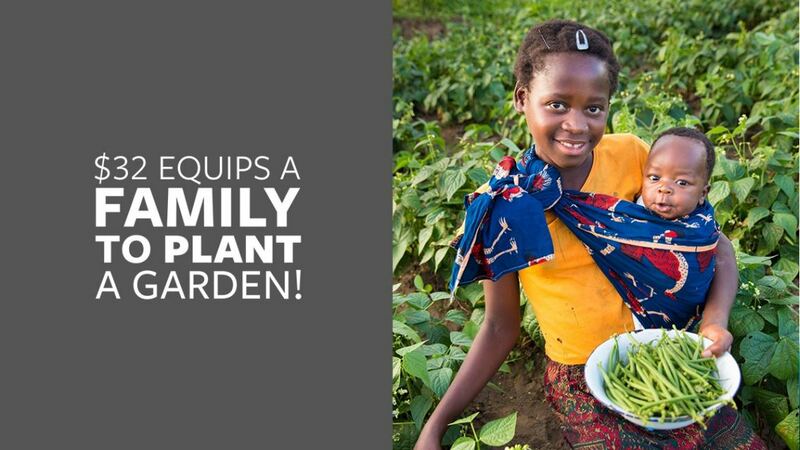 This is the case in Zimbabwe, where PlantHOPE Kits — complete with a simple bucket drip-irrigation system — are an answer to prayer for hungry children and families. As with so many countries around the world, drought, failed crops, and malnutrition have claimed lives and crippled entire communities in Zimbabwe. But this is changing in some areas, thanks to amazing friends like you who so generously partner with Global Aid Network® (GAiN®), the humanitarian partner of Cru®. Please partner with us today — and help rush PlantHOPE Kits to hungry and hurting families. 2,500 PlantHOPE Kits are needed for families in Africa and Central America by June 30. Consider how YOU can make a difference in the lives of these families! The good news is that it costs just $32 to provide a kit for a family in need through GAiN. And as the kits are given through our field partners, doors open to relationships where the eternal hope of Jesus is revealed to people who are spiritually hungry too. Please give a generous gift today of $16, $32, $64 or whatever is right for you. Any amount goes a long way to provide a steady source of food and income for families in need.